I’ve been trying to decide which dish I want to share with you next as we’ve had a few large parties and gatherings in recent weeks so recipes aplenty! If the weather had stayed a tad cooler and far more grey, I was going to share a delicious Lamb Potjie recipe (a traditional Afrikaans South African recipe and way of cooking that stems from the descendants of the early Dutch settlers making their way across the African plains in their ox wagons, cooking over an open fire with large cast iron pots on 3 legs. The word “potjie” means a small pot, but some of them actually aren’t that small. Anyway, I digress…this heat has meant I’m leaning more towards the fresh salad I prepared for guests at my birthday party recently which accompanied the potjie, home baked bread, savoury muffins and puddings, some of which I’ve already shared with you. My sister-in-law even liked the photo on Facebook so much she asked for the recipe immediately! It is a winner. Really easy to make combining simple flavours and all ingredients are green, making this a true Green Salad. It will brighten up any table and the dressing is whipped up in seconds and can be used for any number of different salads. I came across this recipe in Annabelle Langbein’s latest recipe book: A Free-Range Life – everything you need for a great Summer!, which I was very kindly given by one of my good friends for said birthday a few weeks earlier. 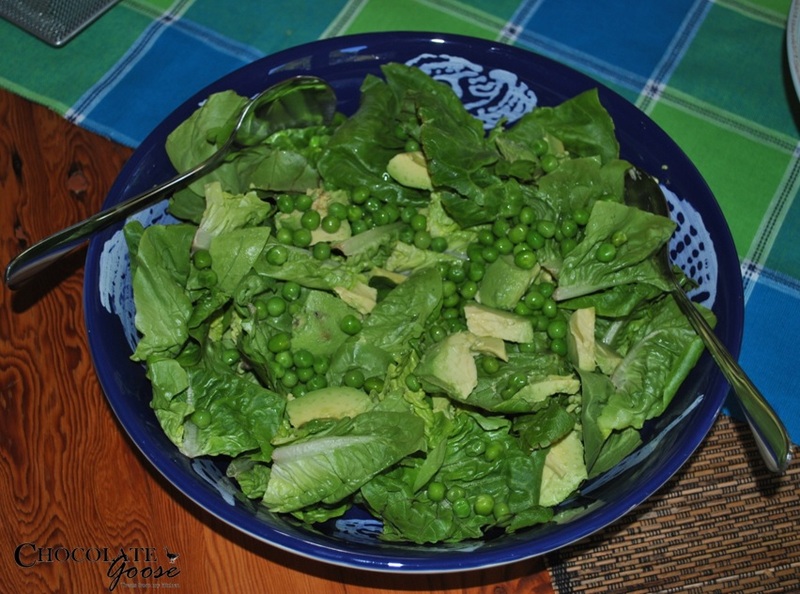 Place spinach or cos leaves on a big serving platter or bowl and top with the avocado chunks, followed by the peas and mint. Just before serving, drizzle with the dressing and season to taste. I have to be honest and admit that I didn’t bother measuring the ingredients for the dressing. I’m happier when it’s a dash of this, a grind of that, a dollop of whatever…I left out the garlic and salt and pepper and replaced the white wine vinegar with red wine vinegar and it was still heavenly. Place all ingredients in a small jar or jug and either shake (the jar) or whisk (if in a jug) to combine. Keeps in the fridge for up to a week and is delicious used on all kinds of salads.